I am sometimes asked, "Hey, if you carry a gun, what do need Krav Maga for?" 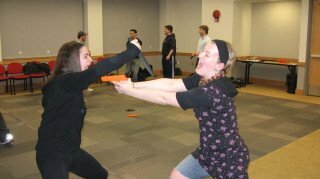 It is true that with the invention of firearms martial arts took a step backwards. From a distance a gun will beat the best trained martial artist of any style. (See Raiders of the Lost Ark), but there is still a great need for martial arts, and Krav Maga, in today's less than perfect world. The fact is it takes time to draw and fire a weapon, even for a trained shooter. A standard arrest can go wrong; a person can attack from short range without warning. In such situations your handgun is almost useless. Against a knife the situation is even worse. If you rely only upon your handgun – you just might get killed. Most people, law enforcement included, have no idea how fast a knife wielding assailant can move. In a blink of an eye he can be upon you. I have seen police videos of actual stabbings and it is frightening. I have seen multiple armed police officers getting stabbed one after another, afraid to open fire since the assailant 'only' has a knife. Finally someone realizes that a knife is a formidable weapon against a gun, and shoots the guy. If you have a hand gun, realize that it does not provide absolute protection against a knife, especially as the distance decreases. Personal Safety Expert Professor Arthur Cohen introduced me to the concept known as Tueller's drill. It is a drill which shows that most people can cover 21 feet in about 1.5 seconds. Sgt. Dennis Tueller of Salt Lake City Police Department conducted experiments which led to the conclusion that an attacker with a knife in his hand covers 21 feet in 1.5 seconds. Therefore anything under 21 feet is considered to be in the zone of "imminent danger of death or great bodily harm." In other words a person with a knife or any edged weapon is a direct and imminent threat to you if that person is within 21 feet (7 yards). Research shows that a person with a knife who is closer than 7 yards can stab or cut you before you can stop them with a gun. Most police officers, even with the gun already in hand, cannot hit a target twice before the assailant can cover 10 yards. Cutting that distance down to around 7 yards takes lots of practice and training. So, you see, "primitive" weapons are deadly weapons. That is why in Krav Maga we spend a lot of time working on knife defense. All the knife wielding assailant has to do is get within 7 yards before rushing you and you are in mortal danger. The best bet is to step away as you draw your weapon, better yet; step at an angle, this will give you more time to draw your weapon. Realize that there is no such thing as a safe distance from a knife; thus, shoot if you can. Many armed police officers were killed by assailants armed 'only' with knives. They underestimated the lethal ability of the blade. Another technique we use, if we don't have time to draw the weapon, is kick the assailant with a front kick as we step back and draw the handgun. Of course, no matter what, it is important to train in knife defense techniques and not to over rely upon the handgun. The above blog was written many years ago. How many people read it back then? How many took up martial arts, Krav Maga, training since then? I do not know but I do know that this scenario has happened countless times over the past years. I do know that here in Israel many police officers, military and armed civilians were stabbed and mortally wounded by Arabs with kitchen knives, meat cleavers and simple knives that can be purchased in any hardware store. I do know that many were stabbed as they attempted to pull out their handgun. I know that they felt secure: they fell into the trap of "weapon reliance". Many young people are dead. What will it take for people to wake up? How many funerals must you attend? How many widows must be comfort? How many parents must mourn the loss of a son or daughter? 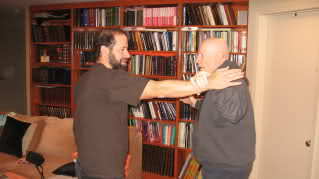 I mention in this blog my dear friend, teacher and mentor Arthur Cohen of blessed memory. I owe him a great deal; for his wisdom, guidance and teaching me to look beyond technique. He was a pioneer in his way of thinking outside the martial arts box. He worked tirelessly to teach others and awaken them to the dangers that lurk out there. He lost a female high school student to violence and this affected him deeply. He traveled wherever he was welcome to spread the word. Financial compensation did not matter to him. Until the day he suffered a stroke he was still working. I saw his desk at his home in Florida, everything was laid out as if he would be back in a minute; his business cards, his letters. He was always trying to reach more people with his message. He has passed on now but we must continue the task, of trying to wake people up, of seeking new and better ways to train, of thinking creatively and for caring passionately about people. Join our team of instructors making a difference all over the world. Our system is easy to learn and teach.